A flight through air to withered land. Beware the storm, the desert spanned. A hard-won treasure now is lost. Richard, Orkan, and Melek continue plummeting down the misty cliffs below. Then, as Richard starts to see his mountaneous surroundings, he notices a bid-like shape heading towards them. His fall is abruptly halted as a giant set of talons plucks him from the air, and he turns to the side to see Melek and Orkan gripped inside another talon. He looks up and notices a fluttering of giant feathers before he blacks out. 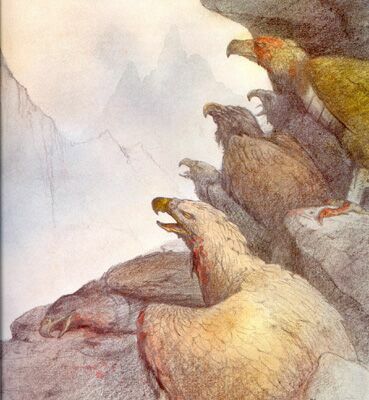 When he and his companions awaken on solid ground, he is surprised to see a giant bird towarind above them. The bird introduces himself as Oganga, a survivor of the final battle. 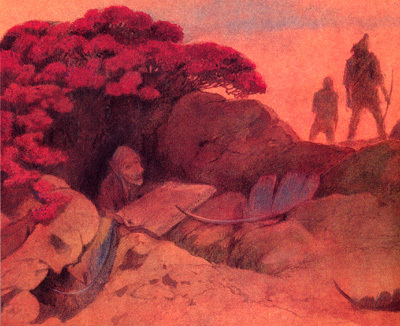 Orkan tells Oganga that Juroot has been freed from the City of Stone. Oganga states that he knows that because he had just come from Petropolis, where Juroot and his troops are now fighting for their lives. Apparently, after Richard and his friends had left, an army of giant earwigs had marched into Petropolis. Richard angrily asks Oganga why he didn't stay to help Juroot, and Oganga replies that he did for a while. However, Juroot had urged Oganga to find Richard because Richard's task is far more important than his. And luckily for Richard and his companions, Oganga had taken Juroot's advice. Richard agrees sheepishly and thanks Oganga for saving their lives. Oganga decides that it would be best for them to be on their way. He states he'll fly ahead and make sure that the path ahead is safe and he then takes off, with the trio following him on the ground. As they follow Oganga, Melek reads aloud the next prophecy. Richard shudders at the last line, thinking it may apply to the pod he had recovered from Baal, and decides to keep on his guard. As the three continue moving ahead, they see dark clouds with lightning flashing all over. Then they begin to hear a harsh roaring noise behind them. They quickly turn around to see a black funnel twister spiraling in their direction. The trio frantically look around for a place to hide, but there is no underground cover. Richard notices a small gully and leads his friends to that, praying it will be enough. As the air around them grows deafening, the tornado washes over the gully. Orkan and Melek are quickly torn from the gully and into the air. 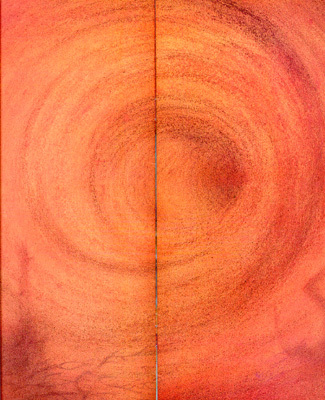 Richard is left looking into the tornado's twirling funnel before he, too, is plucked from the ground towards the ochre sky. Meanwhile, Oganga, oblivious to what was happening to his companions, is flying far ahead of the mountains bordering the desert when he notices movement among the crags. 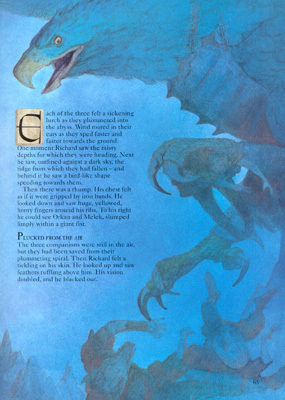 He flies down to investigate and sees a group of battered birds sitting on a ledge, recognizing them as birds who had flown with him during the final battle. All of the birds are badly injured and one appears as if he won't survive for very long. The birds quickly tell Oganga their tales of now living in a land filled with enemy eyes, but one story draws Oganga's attention. One of the birds tells Oganga that a Life Force Pod is kept in the mountain lair of Enlil, an evil bat-like creature. The bird had heard the tale through an escaped prisoner, who had overheard Enlil bragging to a soon-to-be executed slave that the pod would never be recovered. Oganga thanks his comrades and, reluctantly, flies off to tell Richard of the news. But when he sees the twister rolling across the desert, his heart sinks and he begins a search for Richard and his friends. Meanwhile, the twister carries Richard, Orkan and Melek deep into the desert before it slowly degrades and releases the three gently, thankfully not dissipating while holding them in midair. 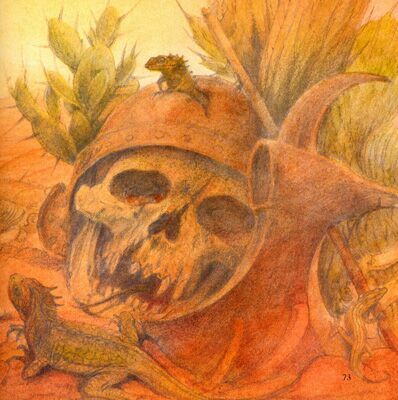 Richard looks around and notices that they had landed in a kind of bone graveyard in the desert. He sees his two friends a short distance away and heads towards them. Even though the heat is beating down on him, he is surprised by his endurance, though he knows he and his friends need to find water quickly. Thankfully, Orkan notices several cactuses amongst the bones. He uses his sword to split open the plants, revealing a watery pulp behind it. The three drink the savoring liquid until they hear the flapping of wings. Moments later, Oganga lands near them, saying he has been looking everywhere for them. Oganga then proceeds to tell Richard about the pod in Enlil's possession. He goes on to warn Richard that Enlil has a wife, Erna, who's just as vicious as Enlil. It's guaranteed that those two will be watching the pod night and day. But Richard points out that it doesn't matter; they had to get the pod no matter what. Oganda agrees and says he will take the three there. He takes them up in his talons and sets a course for the mountainous horizon. As they head towards the Wolfkill Mountains, Oganga informs them that they'll take a break. Just then, loud screeches fill the air, followed by a group of menacing vultures. Oganga recognizes them as sky pirates and tries to lose them, but the weight of the three in his claws slow him down. Oganga decides the best course of action would be to land. Swooping down to a hill, Oganga makes a skid across the ground with his companions in toe. The vultures follow close behind, preparing for an attack. Then, a giant bird rises above the flock of sky pirates. It spreads its wings out and bolts of lightning streak from its sharp talons. The bolt luckily misses the trio on the ground, instead singeing a nearby outcrop. 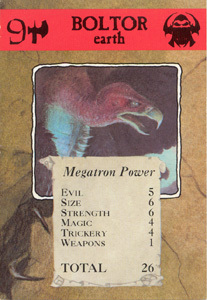 Oganga recognizes the vultures' leader as Boltor, the Bird of Thunder. 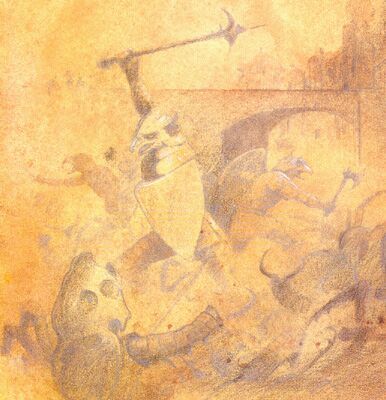 He urges Richard and his friends to take cover while he took care of Boltor, and then flies off to meet his foe. Richard grabs the amulet and prays for Golan's assistance; he immediately senses Golan's voice telling him to look for a red bush. Richard sees the bush and leads his friends towards it. There, they see a small crevice beneath the tree's roots and slide inside. To their surprise, they find themselves inside an abandoned den for some small creature. Feeling safe from the sky pirates, they peer outside to watch the battle in the skies above. Oganga soars above Boltor magestically, encircling the Bird of Thunder before swooping down towards his adversary. Boltor flips his body and fires bolts of energy from his talons, lighting up the sky with his lightning attack. 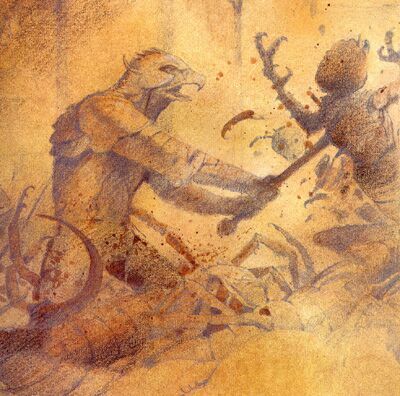 Oganga dodges Boltor's attack and tears down at his enemy, sinking his own talons into the Bird of Thunder's breast. Boltor screeches in pain and plummets to the ground, taking Oganga with him. The two disappear from sight as they fall. The trio wait for a while before Orkan decides that they should get some sleep, citing that there is nothing they can do other than wait for Oganga to return. Orkan would take the first shift to stand watch while the others slept; Richard and Melek don't argue. As the human and the dwarf drift off to sleep, Orkan keeps watch, doubting they would ever see Oganga again. He then hears something coming from the den. It is Melek, singing a strange song in his sleep with very dark lyrics [in quotes section]. Orkan finds no understand in the words and continues his watch. He wakes with a start, horrified that he had fallen asleep. Luckily, there are no signs of any birds. Relieved, he goes to wake Richard. Once Richard is awake, Orkan tells Richard of Melek's words, but Richard can't make much sense of them either. He also decides that there is very little point in waiting for Oganga and that it would be best to continue movie. Waking Melek up, the three continue their journey. As they step onto a hillside, they see the signs of a fierce battle. Torn feathers and dried blood cover the ground, and signs of Boltor's thunderbolts lay everywhere; however, there are no bodies to be seen. Hoping that Oganga is all right, the trio continue heading down the slope. Soon, the slope grows steeper and steeper until they absolutely need Melek's rope to continue on their way. Soon, the slope gives way to a cliff leading to a wooded valley below. They take the most direct route down there, but the path grows more and more difficult. Just then, as they inch along a narrow ledge, Melek loses his footing and falls out into space. Luckily, the rope halts his fall, and his friends begin pulling him back to safety. But as soon as Melek's fingertips grasp the ledge, they hear a loud snap and the Book of Prophecies falls down the mountain. It bounces off the hillside and spins through the air before disappearing in the ground below. 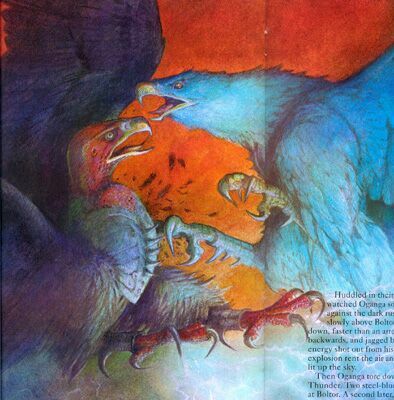 Oganga is a giant blue bird that was one of the survivors of the final battle. While looking for other survivors, he flies over the city of Petropolis to see his leader and Guardian Juroot fighting for his life. Oganga helps out in the battle for a while, but Juroot urges Oganga with Richard and his more important task of saving the Ancestral World. Oganga takes Juroot's advice and is just in time to save Richard and his friends from certain death. As a warrior, Oganga is strong and cunning, able to evade and lose his opponents or more than hold his own in close combat. The giant vulture-like bird Boltor is a menacing creature that holds his domain over the Valley of Death and the Wolfkill Mountains. The leader of a band of sky pirate vultures, Boltor is feared because of his terrifying ability to fire bolts of lightning from his sharply curved talons, able to kill prey from a long distance away. 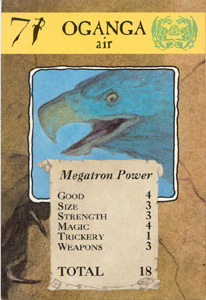 Unlike most vultures, Boltor and his sky pirates will devour creatures that aren't even dead. 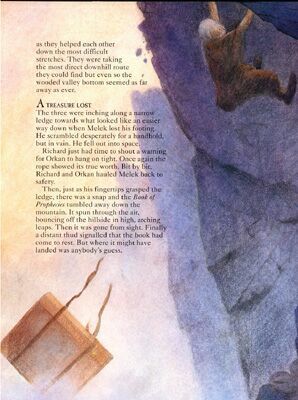 The pod that Richard had recovered from the Tolosh and then lost to and regained from Baal is the Pod of Endurance. The names of all the pods were provided via game tokens used in one of The Ancestral Trail's many card games, and it's from these names that the reader must guess which pod Richard has found. Other pods include the Pod of Knowledge, the Pod of Justice, and the Pod of Valor. What pod will Richard locate next in his quest to save the Ancestral World from the Evil One? "I have to warn you. Enlil is not alone. He has a wife, Erna. She is just as vicious as Enlil and very greedy. They live in a dying volcano whose fires are constantly replenished by teams of slaves. They never let their possessions out of their sight. The pod will be watched night and day. You can count on that." "Sky pirates! They are vultures who don't even wait until their prey is dead before they go in and start feeding. Don't worry, we'll soon lose them." "This is worse than I thought. 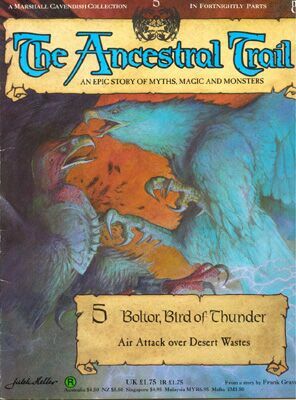 That is Boltor, Bird Of Thunder. His powerful thunderbolts can kill from a distance. You must get under cover fast. You're not safe here, out in the open. Leave me to fight him in the air. I know his tricks and I've got a few of my own. Now go and hide, quickly." "Before the sun, behind the moon, the days like thunder run. By twenty-six the time is up. All evil will be done." "It sounds like one of the prophecies. We'll just have to wait and see what it means, though. The important thing now is the quest. If Oganga has not returned, there's no point in waiting here. For all we know he could be dead. I think we should move on."